Both the style of this painting and its subject, the Three Graces dancing to the music of Apollo, were inspired by Italian Renaissance art. The models were friends and relatives of the patron and collector Constantine Alexander Ionides. 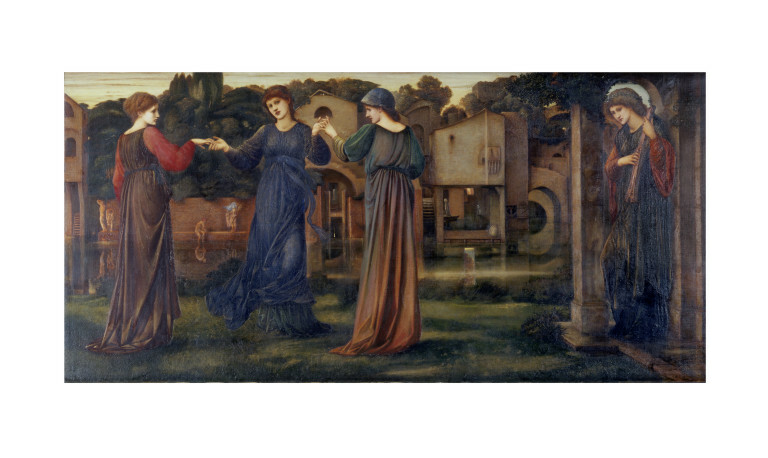 His cousin Mary Zambaco, who posed for the woman on the far left, was for a time Burne-Jones's lover. 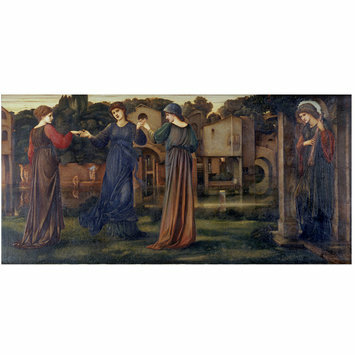 Burne-Jones was acquainted with the Ionides family by 1869 and the Mill was commissioned by Constantine Alexander Ionides. The three female models, also related to the family, were Aglaia Ionides, Marie Spartali, and Maria Zambaco (Burne-Jones was moreover involved with the latter). An undated letter from Burne-Jones at the NAL (86.WW.1) informed Constantine Alexander that the picture was nearly ready. According to his collection's inventory (private collection) Ionides paid £905 for the Mill on 21 April 1882. Bequeathed by Constantine Alexander Ionides, 1900. Vikutoria & Arub?to Bijutsukan-z? : eikoku romanshugi kaigaten = The Romantic tradition in British painting, 1800-1950 : masterpieces from the Victoria and Albert Museum / selected by Mark Evans [Japan : Brain Trust], 2002. 185 p. : ill. (chiefly col.) ; 30 cm. "Mr Burne Jones's other large picture, which he has called, simply, we suppose, to give it a label of some kind, At the Mill, is in the opposite key. It represents - But such a beginning is rash, for it would be by no means easy to say what it represents. Suffice it being that three very pretty young women, in old Italian dresses, are slowly dancing together in a little green garden, on the edge of a mill-pond, on the further side of which several men, very diminutive figures, are about to enter, or about to quit, the bath. To the right, beneath a quaint loggia, a fourth young woman, the least successful of the group, is making music for her sisters. The color is deep, rich, glowing, exceedingly harmonious, and both in this respect and in its being, in feeling and expression, an echo of early Italianism, the picture has an extraordinary sweetness. It is very true that I have heard it called idiotic; but there is a sad want of good-humour in that. it is equally true that I have not the least idea who the young women are, nor what period of history, what time and place, the painter has had in his mind. His dancing maidens are exceedingly graceful, innocent, maidenly : they belong to the land of fancy, and to the hour of reverie! When one considers them, one really feels that there is a want of discretion and of taste in attempting to talk about Mr Burne Jones's pictures at all, much more in arguing and wrangling about them. They are there to care for if one will, and to leave to others if one cannot. The great charm of the work I have just mentioned is, perhaps, that to many persons it will seem impregnated with the love of Italy. If you have certain impressions, certain memories of that inestimable land, you will find it full of entertainment. I speak with no intention of irreverence when I say that I think it is delightfully amusing. It amuses me that it should be just as it is, - just as pointless as a twilight reminiscence, as irresponsible as a happy smile. The quaintly-robed maidens, moving together in measure, and yet seeming to stand still on the grass; the young men taking a bath just near them, and yet the oddity being no oddity at all ; the charming composition of the background, the picturesque feeling, the innocence, the art, the color, the mixture of originality and imitation, - all these things lift us out of the common. Sweet young girls of long ago, - no-one paints them like Mr Burne Jones. The only complaint I have to make of him is one cannot express one's appreciation of him without seeming to talk in the air".